Spiders, camellia, dying parents, Rilke, a younger man at a Geneva street market—these things become obsessions to Roger Lewinter in Story of Love in Solitude. Written in dense yet fragmentary paragraph-length sentences, Lewinter’s unique style represents a daunting challenge to translators. Expertly rendered into English by Rachel Careau, Mr. Lewinter’s grammatically concentrated passages become entrancing. In three stories spanning a meager 37 pages, he creates entire worlds, labyrinthine but also sensual. Lewinter’s prose is the perfect balance between the intellectual plumbing the depths of philosophy and a practical explorer of tastes and sensations. Marcel Proust’s super-long sentences and lush prose delineating the hierarchies and aristocratic rites of Second Empire France are the most obvious literary antecedent to Roger Lewinter. But Lewinter’s agenda is not Proustian. It remains grounded in the present, nostalgia and regret intertwining with the immediate. 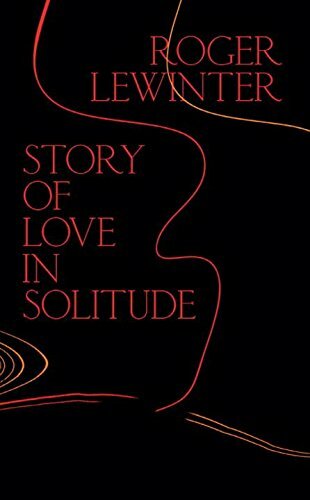 Story of a Love in Solitude begins with the titular short story. The plot involves him dealing with a single spider in his apartment. As he captures and expels the first, another appears. This cycle repeats itself until he doesn’t find any more. The story itself feels akin to a clown from Samuel Beckett stuck in a cruel feedback loop. The disarmingly simple story reveals a complex and nuanced psychological portrait of a man in crisis. It is an hors d'oeuvre for the feast to follow. The second story, “Passion,” is a meditation on death, decay, and rebirth. As with the first story, the plot is simplicity itself. Over several years, Lewinter takes care of several camellia plants. But the plot is shot through with reminiscence, botanical care, and horror. The narrator is assumed to be Lewinter, since he discusses his ongoing translation projects. He meditates on issues surrounding the translation of Sonnets to Orpheus and The Duino Elegies, both challenging poetry cycles written by German poet Rainer Maria Rilke. His obsessive care for the camellias and his meticulous descriptions of the plants bring to mind the luxurious prose of Joris-Karl Huysmans. “[S]o that I was asking myself whether, once it became acclimated, it would still produce, despite everything, a flower—their color, deep crimson bordering on purple, seemed to me as exceptional as their form, opened out flat—without the crumpled petals at their heart like those of a peony—, like roses of medieval illustrations—,” And so on. This excerpt gives a hint at the flavor of Lewinter’s prose style. Unlike Proust or Huysmans, Lewinter’s prose begins in a deceptively pedestrian way and then runs on and on in a massive sentence, except that the sentence is an accumulation of fragments. Proust has prose that creates the atmosphere of a waking dream, lulling and seducing with a hothouse flower voluptuousness. Lewinter urges on, each fragment and each image bringing about a compulsion and a need to reach the conclusion. Despite its pedigree of nuanced sensuality and refined intellection, the prose moves with the speed usually associated with the thriller genre. The third story is a gorgeous exploration of infatuation. “Nameless” follows Lewinter as he witnesses a younger man working at a Geneva street market. While not a love story, a romance, or even erotica, it records Lewinter’s feelings across a spectrum of emotions. “[A]s I waited my turn, by placing myself at a slight angle let my eyes wander over him—, I knew that I shouldn’t have looked at him[. ]” The story’s intensely voyeuristic atmosphere shades into a comedy of manners when he finally confronts the nameless man to buy something. But Lewinter peppers the story with insights into human relationships. “[P]utting off approaching him until Thursday—Saturday morning, I saw that he also worked the Coutance Market, across from La Placette, assisted by a girl his age, whom I supposed, from the similarity of their appearance as well from their ease together, to be his sister, since he didn’t have the opacity of those who live with another as one—, prolonging the suspense of the vision without an exchange carried me; so that it wasn’t until two weeks later that I decided, one Monday morning, to buy from him eight ounces of peas[. ]” In this brief passage Lewinter weaves together his anticipation and longing, an acerbic observation about mutual cohabitation, and his mundane task (buying peas). The story, like the volume in general, burst forth with such remarkable passages. New Directions has released Story of Love in Solitude in a bilingual edition. At the end of the book the three stories are presented in their original French. Now Roger Lewinter can be enjoyed in both languages. His unique literary voice, seamlessly translated by Rachel Careau, is that of an obsessive, a philosopher, and a miniaturist.